George Ralph Miller, born August 15, 1935, passed to his eternal reward on October 6, 2018. He was preceded in death by his spouse of 57 years, Lola Rae (Counceller) Miller. His parents were Joseph and Elizabeth (Nagy) Miller of North Dayton, Ohio. 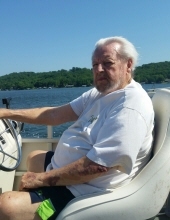 He resided in Dayton, Ohio, Olathe, Kansas and most recently Lake of the Ozarks, Missouri. His career started at Dayton Power and Light, and he retired from Kansas City Power and Light. George was an avid pool player and made friends wherever he went. He was known among his family as the creator of pithy nuggets of advice known fondly as “George-isms.” He is survived by four children, nine grandchildren, and three great-grandchildren. To send flowers or a remembrance gift to the family of George Ralph Miller, please visit our Tribute Store. "Email Address" would like to share the life celebration of George Ralph Miller. Click on the "link" to go to share a favorite memory or leave a condolence message for the family.